Immaculata-La Salle students Michael Matamoros, Cameron Ryals, and Daniel Burke, at right, present Key West High players with a ,000 disaster relief donation prior to their game last month. MIAMI | Relief efforts have characterized much of the first few months of the 2017-2018 school year at Immaculata-La Salle High School. The school community rallied to support and aid those affected by Hurricanes Irma and Maria, as well as the devastating earthquake in Mexico. All told, the ILS community collected over $11,000 and thousands of pounds of food and goods for victims of these natural disasters. These efforts were spearheaded by Milagros Beltran, director of Campus Ministry. Working in conjunction with nearby Sts. Peter and Paul School, Beltran arranged to have water, nonperishable foods, and medical supplies shipped to Puerto Rico in the wake of Hurricane Maria. The supplies gathered by the two schools made their way to the island as part of a larger relief effort by singers Chayanne, Ricky Martin and other Puerto Rican celebrities. Another relief effort, focused closer to home, sought to aid those impacted by Hurricane Irma in the Florida Keys. 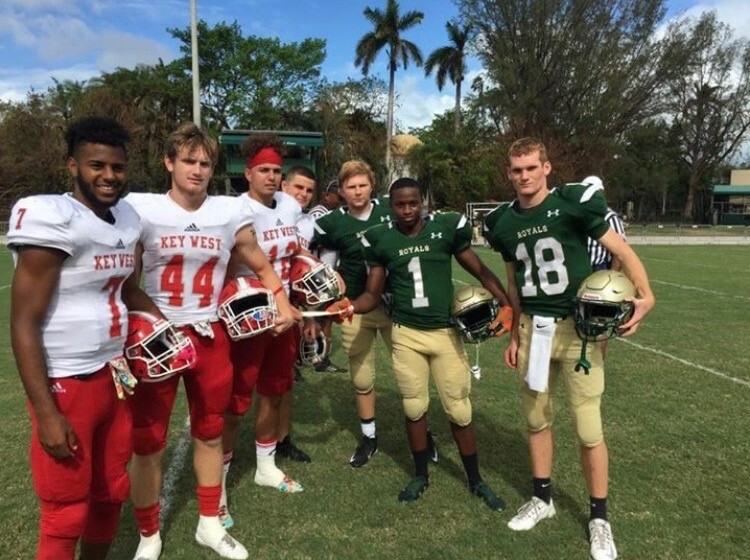 In a pregame ceremony before the ILS football team hosted Key West High School in early October, the captains of the ILS team presented the captains from Key West with a check for $3,000 to aid their school in disaster recovery. While these efforts developed in response to the immediate needs in the affected areas, ILS maintains ongoing initiatives on a year-round basis. Service-oriented clubs and activities — such as SALTT Camp, the Angel Tree Project, or the Wishbone Project — allow students, and even alumni, to engage and make a difference in the community. SALTT (Service and Leadership Today and Tomorrow), for example, is a year-round mentoring program for children of Guatemalan migrant farm workers in Palm Beach County. Most of these workers are ethnic Mayans who fled their nation in the 1980s and 1990s to escape mass killings during Guatemala’s civil war. ILS students and alumni visit these children several times a year and run a two-week summer camp. Under the direction of moderator Maria de la Guardia, who created the program at students’ behest in 2000, SALTT was recognized in 2014 by the Charity and Social Service Honors program sponsored by the National Shrine of the Immaculate Conception in Washington D.C.
Now in its 59th year, Immaculata-La Salle High School adheres to the Salesian charism and the educational philosophy developed by St. John Bosco, which centers on the teaching of the young and the care of the poor. The Salesian spirit of service is so much a part of the fabric of ILS that veteran teacher Ana Roman-Gonzalez wove it into the tapestry of her 10th grade World Literature class. Spurred on by the depiction of famine and starvation in Pearl S. Buck’s “The Good Earth,” the 10th graders worked in small groups to identify and develop a relationship with an organization that aids in alleviating circumstances similar to the ones described by Buck in her famous novel. David Fernandez teaches English and serves as head women's basketball coach at Immaculata-La Salle High School.